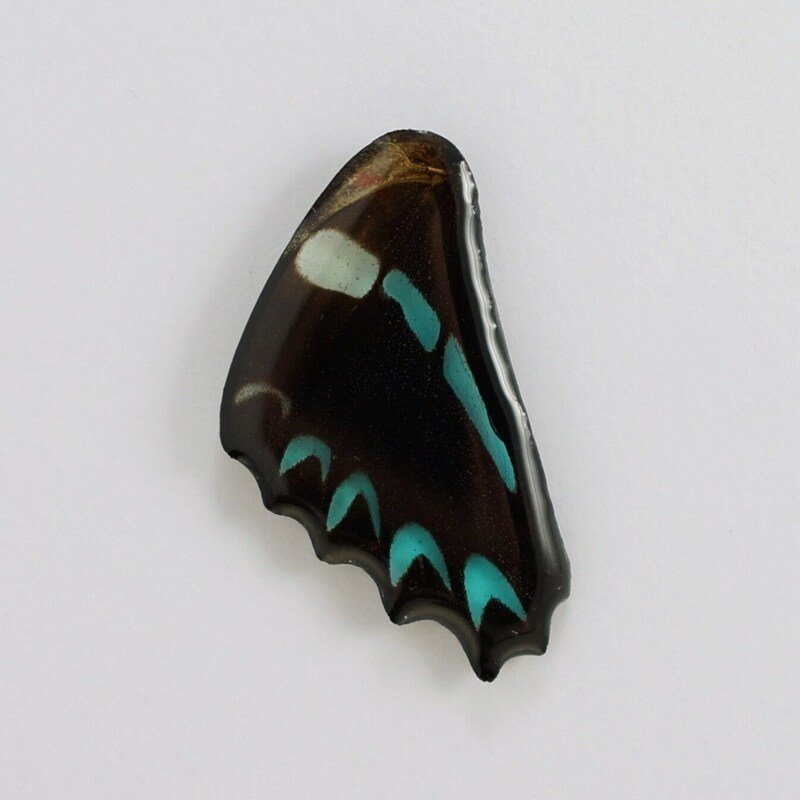 This REAL Graphium sarpedon butterfly wing has been hand-preserved into your choice of bead, pendant or necklace style. All wings are from, and their purchase further funds conservation efforts. Wing colors, and sizes vary as shown. JUST THE WING: for those looking to create their own design from the preserved wing. A standard 1/16" hole is included for your creations. Custom size and placement of holes is available upon request. 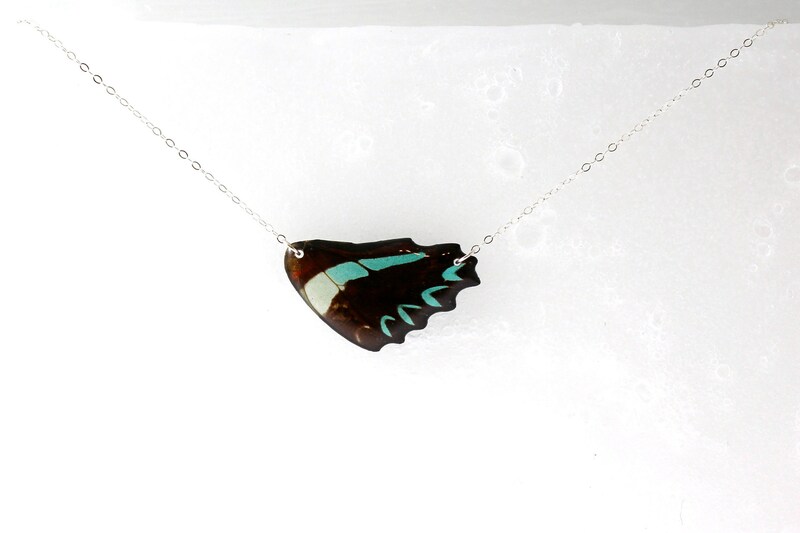 PENDANT WITH RING: the wing is preserved, and hung from a metal loop. Ready to be added to your own chain. Your choice of ring metal. Waxed cotton cord with double slipknots optional. PENDANT WITH BAIL: A sterling silver bail is added to the wing for a polished finish. Sterling cable chain with spring clasp or waxed cotton cord with double slipknots optional. Custom metals and styles available upon request. 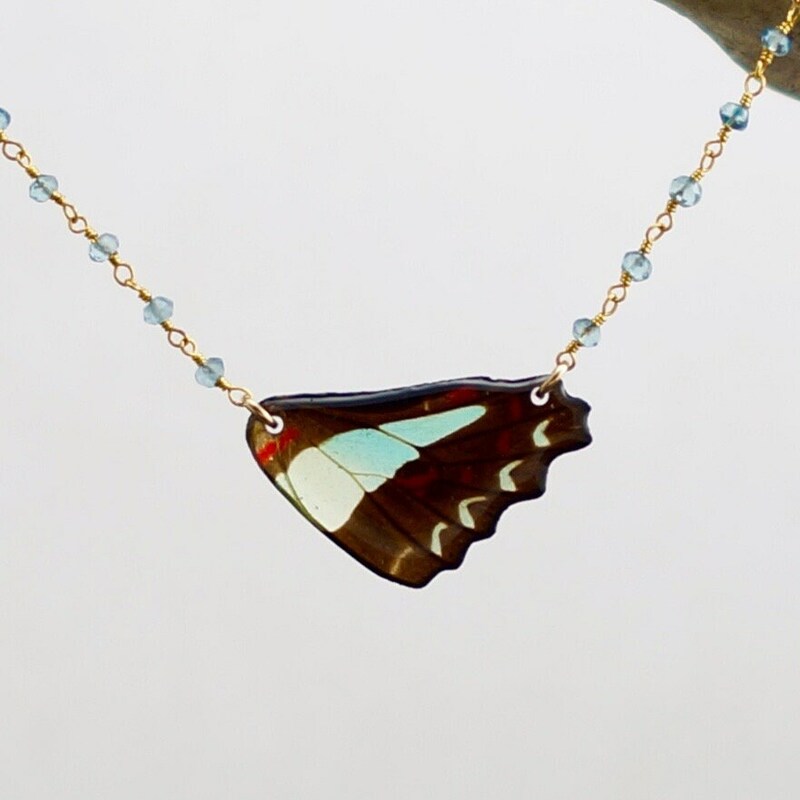 DROP NECKLACE: A real wing hanging from a ring on a cable chain. Spring clasp. Metal and length of your choice. 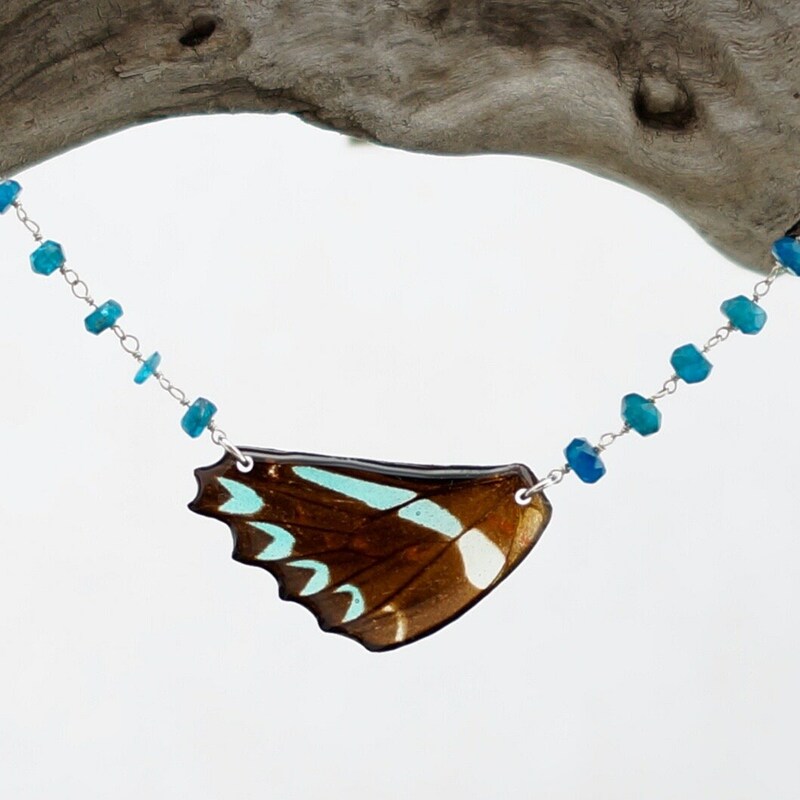 INLINE NECKLACE: A real wing hung between metal chain for an inline necklace design. Spring clasp. Metal and length of your choice. *Requests for specific hues, sizes, and custom work are welcome. Beadwork is available upon custom request at varying prices. All wing preservation is done collaboratively by Holly Ulm and Greg Sisco. 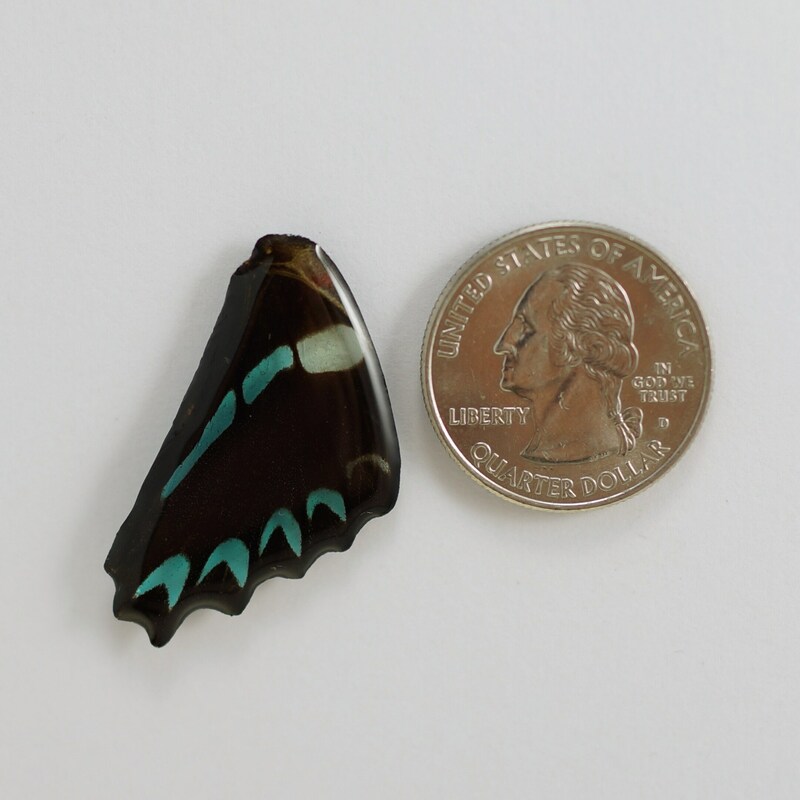 One of 20 starting processes is used, depending on the reactions of the scales covering the wing. All wings undergo scale setting; color preservation (unaltered); initial hardening; at least 4 coats of jeweler's grade epoxy; sanding/sculpting; and finishing. This takes approximately 2 weeks, and renders the wing waterproof, prismatic (in full sun or under a full-spectrum light bulb), non-toxic, and lightweight. The wings are hardened, yet the edges are hand tapered to a perfect finish with similar durability and care as eyeglass lenses. The formulas, tools, and methods used have been custom tailored to suit this proprietary process. No casts or molds. Our butterflies are purchased from conservation groups around the world, which funds efforts in butterfly repopulation and land conservation. This not only helps the butterfly populations, it also allows us to use gorgeous exotic species. We also preserve donated specimens. - Plant native host and food plants for local butterfly and moth species. - Foster wild-found caterpillars for release. Be sure to learn about caterpillar identification, cleanliness, containers, water, chrysalis/cocoon development, and feeding before getting started. - Contact local road departments, and collect caterpillars to foster for release before they mow area ditches. - Get educated about pesticides, and eliminate the use of those that also harm helpers in the food chain. - Get involved with Wild Ones, Monarch Watch, Xerxes Society, NAMBA, or other wildlife supporting groups. - Participate in a butterfly count, or other similar volunteer effort. 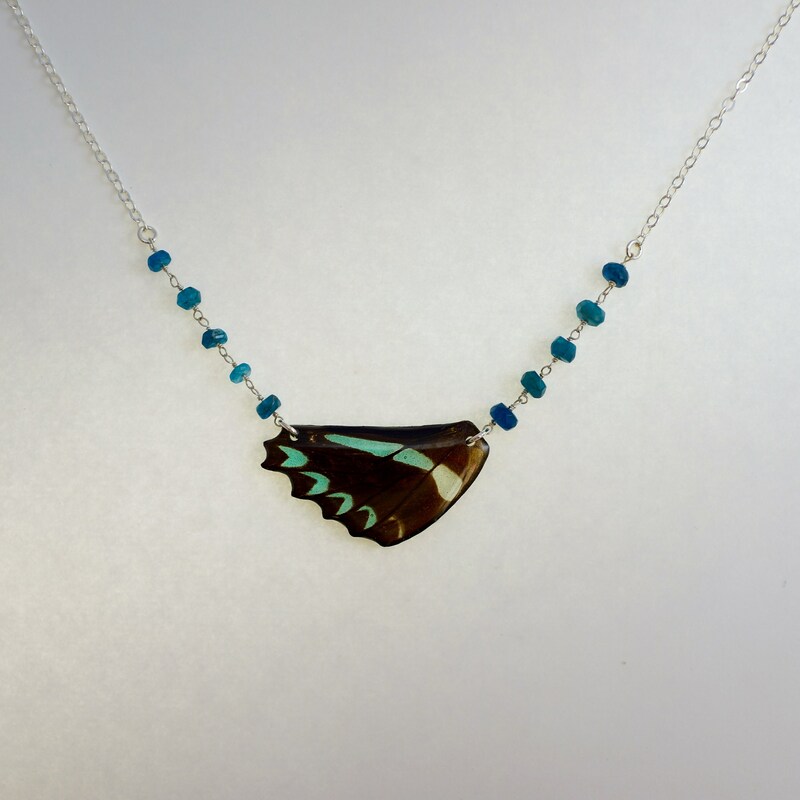 10% of all profits are additionally donated to butterfly conservation. Thank-you for your support. Expect fast turn around times through the USPS. Special shipping services available upon request. If you have a problem, we'll figure out a solution. We're pretty nice about things. We're from Minnesota. It's in our contract.